We went with the first 6 horses to get evaluated this last week, it went quite well. Halla frá Flekkudal, really promising 5 year old mare by Pyttla frá Flekkudal and Sær frá Bakkakoti. She received 9 for tölt and grace while ridden and 8.5 for all other gaits except gallop, where she got 8. She was shown as a 4-gaiter this year. Really great mare who will improve over the next few years. Ný-Dönsk frá Lækjarbakka, 4 gaited mare by Gustur frá Lækjarbakka and Írafár frá Akureyri. 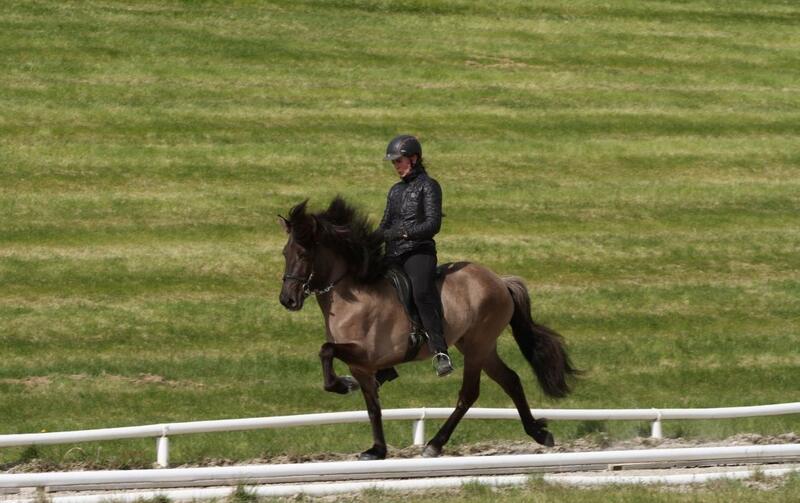 She received 9 for grace while ridden and slow tölt and 8.5 for tölt, trot, gallop and spirit. Gjálp frá Hvammi, 4-gaiter by Gaumur frá Auðsholtshjáleigu and Una frá Hvammi. She received 9 for gallop, 8.5 for tölt, spirit, grace while ridden and canter. Sól frá Meðalfelli, by Esja frá Meðalfelli and Leiftur frá Akurgerði. Really beautiful mare who received 8.44 for conformation and 8 for most gaits. Héla frá Króki, by Greifi frá Holtsmúla and Svala frá Glæsibæ. She received 8.5 for tölt and 8 for most other gaits. Then one stallion was evaluated for conformation, Mosfellingur frá Meðalfelli and he received 7.98. The photos are taken by Svanhildur Jónsdóttir. A great end to the spring’s breeding evaluations!